DIY Friday: Dude, Where’s My Droid? If you’re like some of us here at Really Rocket Science, you look back upon 1977 as a watershed year — a year when, for the first time, you realized what you wanted more than anything else in the world. And what you wanted, of course, was to be Luke Skywalker. Or maybe Han Solo. At the very least, you wanted to have your own droid — a faithful mechanical friend like R2-D2. Fast forward nearly thirty years. Dude, where’s my droid? Technology and industry haven’t exactly delivered the type of personal-pal robot that we saw in Star Wars. But there’s no need to wait any longer. Want a droid? Do it yourself at Astromech.net. Astromech has a complete tutorial page that will help you build your droid — with instructions and real-world experiences on every part, from the dome to the feet to the lights and and cute little R2-D2-like sounds. For inspiration, be sure to check out the photogalleries of droids built by other fans. There’s even a video section showing close-ups of completed droids beeping and blinking in action, and (as an added bonus) this video of droid bloopers taken from the original filming of Star Wars. The articles section of the Astromech site is a fine place to idle a few hours away before you get to work on your droid (you are going to get to work, aren’t you? ); we recommend taking a quick gander at this review of the original R2-D2 robot from the December, 1977 Electronics Today. FARM AID® 2006 takes place on Saturday, September 30 at the Tweeter Center at the Waterfront in Camden, New Jersey. The entire event will be broadcast live on XM Satellite Radio starting at 3:30 p.m., EDT (on X Country, XM Channel 12). The event will feature president and founder Willie Nelson, board members Neil Young, John Mellencamp and Dave Matthews, as well as Jerry Lee Lewis with Roy Head, Los Lonely Boys, Arlo Guthrie, Gov’t Mule, Steve Earle, Allison Moorer, Steel Pulse, Shelby Lynne, Nitty Gritty Dirt Band, Jimmy Sturr & his Orchestra, Pauline Reese and Danielle Evin. Of course, there’s also a webcast. I like their blog, too. Philly’s Bling blog will be covering it as well. What’s espcially interesting is how the environmental impact of this year’s concert is being worked. Purchasing Green Tags from the Bonneville Environmental Foundation is offsetting all of the electricity used at the concert, replacing it with sustainable wind energy. Title sponsor Silk Soymilk has also purchased additional Green Tags to offset the energy used for an estimated 25,000 attendees to drive to the venue. Last I checked, tickets were still available. Their local promotion, Fresh from the Family Farm, a restaurant promotion to benefit Farm Aid, is well worth it (if you live, work or plan to visit the area this weekend). Virgin Galactic has unveiled a concept interior for its (not-too-distant) future spaceliner SpaceShipTwo — and they’ve also released a great computer animated video showing what it will be like for passengers to travel into space on their flagship. NEW YORK – Future passengers aboard Virgin Galactic spaceliners can look forward to cushioned reclining seats and lots of windows during suborbital flights aboard SpaceShipTwo, a concept interior of which was unveiled by British entrepreneur Sir Richard Branson Thursday…. Virgin Galactic’s spaceliners will be specially-outfitted SpaceShipTwo vehicles built by Mojave, California-based Scaled Composites and veteran aerospace designer Burt Rutan. The new spacecraft, designed specifically for space tourism, will be three times the size of Rutan’s SpaceShipOne, which won the $10 million Ansari X Prize for privately-developed piloted spacecraft capable of reaching suborbital space twice in two weeks. The air-launched SpaceShipTwo is designed to seat eight people – six passengers and two pilots – and be hauled into launch position by WhiteKnightTwo, a massive carrier craft currently under construction by Scaled Composites, Virgin Galactic president Will Whitehorn said. For an initial ticket price of $200,000, Virgin Galactic passengers will buy a 2.5-hour flight aboard SpaceShipTwo and launch from an altitude of about 60,000 feet (18,288 meters), while buckled safely in seats that recline flat after reaching suborbital space. A flight animation depicted passengers clad in their own personal spacesuits as they reached a maximum altitude of at least 68 miles (110 kilometers). While the spacesuit designs are not yet final, they will likely be equipped with personal data and image recorders to add to SpaceShipTwo’s in-cabin cameras, Whitehorn said…. Branson’s Virgin Galactic spaceliners are slated to roll out and begin test flights by early 2008 in Mojave, California, with future operational spaceflights to be staged from New Mexico’s Spaceport America beginning in 2009. Explanation: What’s that pale blue dot in this image taken from Saturn? Earth. The robotic Cassini spacecraft looked back toward its old home world earlier this month as it orbited Saturn. Using Saturn itself to block the bright Sun, Cassini imaged a faint dot on the right of the above photograph. That dot is expanded on the image inset, where a slight elongation in the direction of Earth’s Moon is visible. Vast water oceans make Earth’s reflection of sunlight somewhat blue. Earth is home to over six billion humans and over one octillion Prochlorococcus. We’ve written before about how dramatically the intersection of television and computers — particularly through IPTV and satcom– will transform the media marketplace and the media consumption habits of ordinary people. That transformation is several steps closer to reality, if news of new gadgets today is any indication. [I]n other news to come out of the Intel Developers Forum, DirecTV and Intel are joining forces to produce the DirecTV Plus HD DVR — which we first heard about all the way back at CES — allowing viewers to check out content via the interweb when connected to a Viiv PC. In addition, there will be a new software update for DirecTV subscribers by the end of the year that turns subscribers’ set-top-boxes into digital media adapters, the companies said in a press release earlier today. The new DVR, to be released later this fall, will capture 200 hours of standard definition programming or 50 hours of HD, or whatever combination of the two your little heart desires. Apple Computer’s take on the living room became a little clearer… with its preview of a new networking product…. CEO Steve Jobs announced that Apple is working on a product code-named iTV that will allow both Mac and PC users to watch movies or television shows purchased from the iTunes store in their living rooms…. The iTV box won’t be available until the first quarter of 2007, but Jobs said it will cost $299 and walked attendees at Apple’s press event in San Francisco through a brief demonstration of its capabilities. U-verse users, meet HDTV. We just got word that AT&T’s IPTV service is going to be blessed with numerous upgrades within the next few weeks that will include HDTV support, more channels, more VOD, games, personal photos and other unannounced features. This rollout seems to be within the same speculated time frame of October 25th to coincide with the launch of those brand spanking new Motorola DVR’s; whenever it does happen, though, these features will be implemented during the slow viewing times between 11 PM and 5 AM with the hope of minimizing service interruption. On a similar note, AT&T is upgrading DVRs to prep for this rollout, with customers seeing all previously recorded programs erased and all scheduled recordings canceled after October 5th. But keep in mind this is for high-def along with more content, so hopefully the ends will justify the means — you can deal with a few Adult Swim-free nights for the greater good, right? The times, they certainly are a-changin’. On Saturday, the Japanese Aerospace Exploration Agency (JAXA) successfully launched the M-V Launch Vehicle No. 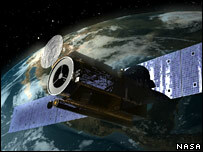 7 (M-V-7) at 6:36 a.m. Japan Standard Time from the Uchinoura Space Center. Within an hour, JAXA started receiving signals from the rocket’s satellite payload — the SOLAR-B, a sun observation "microscrope" nicknamed "Hinode" ("sunrise") by JAXA engineers. The BBC has more on the SOLAR-B and its mission of studying solar flares, which "release the equivalent of tens of millions of hydrogen bombs in just a few minutes:"
The probe will attempt to find out more about the magnetic fields thought to power solar flares, and try to identify the trigger that sets them off. The ultimate goal for scientists is to use the new insights to make better forecasts of the Sun’s behaviour. Flares can hurl radiation and super-fast particles in the direction of the Earth, disrupting radio signals, frying satellite electronics, and damaging the health of astronauts…. 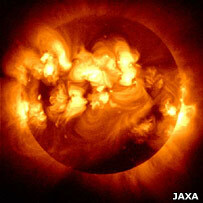 Solar-B is expected to transform our understanding [of solar flares]. It carries three instruments: a Solar Optical Telescope (SOT), an X-ray Telescope and an Extreme Ultraviolet Imaging Spectrometer. They will make continuous, simultaneous observations of specific solar features, to observe how changes in the magnetic field at the Sun’s surface can spread through the layers of the solar atmosphere to produce, ultimately, a flare. "Solar-B acts essentially like a microscope, probing the fine details of what the magnetic field is doing as it builds up to a flare," said mission scientist Professor Louise Harra, from the Mullard Space Science Laboratory, UCL, UK. "What we don’t know is what triggers a flare; we don’t understand the physics of that phase at all. Solar-B will show us how tangled the field is, and how the field lines collide to produce all that energy." In October, NASA will contribute to the growing understanding of solar flares when it launches its Stereo mission – twin spacecraft that will make 3D observations of the sun. Better understanding of solar flares is critical, as John Davis, Solar-B project scientist at Nasa’s Marshall Center, told the BBC. "The information that Solar-B will provide is significant for understanding and forecasting of solar disturbances, which can interfere with satellite communications, electric power transmission grids, and threaten the safety of astronauts travelling beyond the safety of the Earth’s magnetic field," he said. Launch Day Monday — Delta II: Good; SpaceLoft XL1: Almost. Watched the Delta II launch a GPS payload yesterday, live on HD-Net. Gorgeous launch on a beautiful day at Cape Canaveral Air Force Station in Florida. Seeing it in HDTV does make a difference. The Boeing Delta II 7925-9.5 configuration vehicle used for today’s mission featured a Boeing first stage booster powered by a Pratt & Whitney Rocketdyne RS-27A main engine and nine Alliant Techsystems (ATK) solid rocket boosters. An Aerojet AJ10-118K engine powered the storable propellant restartable second stage. A Thiokol Star-48B solid rocket motor propelled the third stage prior to spacecraft deployment. The rocket also flew with a nine-and-a-half-foot-diameter Boeing payload fairing. "If it was easy, everyone would be doing it." Seems the next Ariane 5 launch is now scheduled for 12 October 2006. We’ve written recently about DIY techniques for getting satellite reception on your RV. But doing it yourself, we readily admit, requires actually doing something yourself, which can be a drag (especially on Mondays!) . Sometimes, after all, you just want to lean back and have the sort of unbridled fun that the guys in the photo to the right are clearly having. Luckily for the want-it-now crowd, there are several consumer options already on the market that will bring you (or, more precisely and safely, your passengers) satellite television reception in your minivan or SUV while you barrel down the interstate. 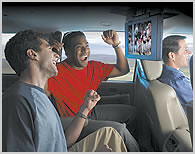 Recognizing the growing interest among American motorists who want the same DIRECTV entertainment experience in their cars that they have in their homes, DIRECTV is now delivering to car video screens live local news, weather, traffic, sports and other local entertainment programming. Local broadcast channels via DIRECTV are now available to mobile customers on the open road within the continental United States to vehicles that have been equipped with a TracVision A7 mobile satellite TV system, launched today by KVH Industries, Inc. DIRECTV will provide mobile customers their local broadcast channels within the designated market areas where it already offers them to home viewers. Local channels availability may vary by market. DIRECTV delivers local programming in 142 markets, representing 94 percent of U.S. television households. DIRECTV’s TOTAL CHOICE(R) Mobile with local channels package, created exclusively for mobile customers with a low-profile automotive TracVision system, is available for $44.99, and offers more than 185 channels. To receive local channels in their car, DIRECTV customers must purchase a new TracVision A7 satellite TV system, which includes an integrated GPS unit and new 12-volt receiver jointly developed by DIRECTV and KVH. The mobile local channels offering is part of a larger strategy by DIRECTV to target the more than 20 million U.S. vehicles expected to have in-vehicle passenger video systems by 2011, according to the leading analyst firm Frost & Sullivan. Delivering uninterrupted satellite reception while an antenna moves at nearly 70 miles per hour is no simple engineering feat, which helps explain why the KVH system is loaded with patents. Just remember, though, that 20 million vehicles are expected to have such a system in place by 2011. So keep your eyes on the road. Ever wanted to have your own Observatory? Stargazing enthusiast Thomas Campbell did, so he created one and put it up in his own backyard, as seen below. Sure, it looks like a simple 2-3 man dome tent, but it’s actually has all of the features amateur astronomer might want and for under $40. "Several years ago, I (not knowing any better) purchased a 60mm refractor (a Kmart Focus model) at a yard sale. The main tube has pretty good optics and the 20mm eyepiece (35x magnification) isn’t too bad, but the other eyepieces are only fair at best, and the wooden mount is pretty wobbly in even the slightest of breezes. The most important reason, however, was light pollution in my backyard. I live in a small town, but live on a highway (with a lot of streetlights) and across the street from a county hospital (lots of light pollution there!). Even so, by cupping my hands around my eyes, on good nights of seeing, I can still make out the Milky Way, so the skies are still fairly dark. I had found an article on the internet about how to make a light blocker out of PVC pipe and heavy-ply trash bags, but with the light coming from all around me, I would need about a dozen of them, and the amount of time needed putting all of those up would seriously cut into my observing time." "…allowed me to view things with my scope that I didn’t think was possible before. For instance, on nights of good seeing, I can now make out all four of the main stars of the Trapezium in the Orion Nebula. Before, I was only able to make out the three brightest stars at best. Overall, I believe I can now see objects about a half-magnitude fainter than I was able to before using the observatory." Not bad for $30! Check out Campbell’s DIY observatory site for more information and maybe even check out some of the other projects he’s done ranging from building an astronomical red-dot finder out of a BB-gun site to constructing a ply-wood tripod & mount. Awesome stuff!